Pink slime? Waste not, want not? Last week it came out that the USDA is looking to buy 7 million pounds of “pink slime” for school lunches. If it sounds like pork spending, you’re close. It’s the ammonia-treated trimmings of beef left on the bone that has to be processed to be “edible.” Basically, it sounds weird and vile. Even worse? I most likely ate a lot of it in 2010. 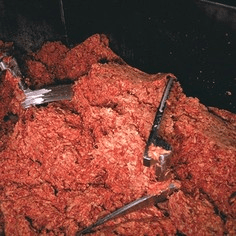 “Pink slime” is the term used for a mixture of beef scraps and connective tissue (formerly used only for pet food and rendering) that is treated with ammonia hydroxide to remove pathogens like salmonella and E coli. […] Even apart from safety concerns, it is simply wrong to feed our children connective tissues and beef scraps that were, in the past, destined for use in pet food and rendering and were not considered fit for human consumption. Due to public outcry, fast food giants like McDonald’s and Burger King have stopped using pink slime in their food. But the federal government continues to allow its use in school food and has just authorized the purchase of ground beef which collectively contains an additional 7 million pounds of pink slime for consumption by our nation’s children. Of course I signed the petition and so have more than 150,000 people. Not only do I want to see “pink slime” removed from school cafeterias, I think any kind of ammonia-treating-meat process should be permanently stopped nationwide. I don’t use ammonia-based products to wash my floors much less use to rinse off animal flesh for my child’s consumption. Boneless lean beef trimmings (BLBT) is a safe, wholesome and nutritious form of beef that is made by separating lean beef from fat. […] One process uses food grade ammonium hydroxide gas, something commonly used in the production of many foods, to destroy bacteria. Whatever process is used, it is all done under the watchful eye of USDA inspectors and according to strict federal rules. Lean finely textured beef is blended into foods like ground beef. Producing BLBT ensures that lean, nutritious, safe beef is not wasted in a world where red meat protein supplies are decreasing while global demand is increasing as population and income increases. I like not wasting and of course meat supplies are costly. I don’t think that Bettina is trying to say that she doesn’t understand the spirit in which this is being done. The meat industry is wants to get every last snippet of beef and gristle to market. Go ahead and rescue all usable parts of the cow – but try to skip ammonia and don’t give them to my students. I have to wonder though… if the USDA goes ahead and disavows the use of “pink slime,” what will replace it? Another flavor of slime? As a speech pathologist, I work to correct speech behaviors. I can’t just tell a kid to stop doing something cold turkey; I have to have an alternative behavior at the ready. So instead of stuttering at the beginning of a phrase, we’re going to try as easy onset. Or instead of giving me a blank look when I ask a question, I might teach a kid it’s ok to answer “I don’t know” (Seriously, so many kids don’t think it’s ok to say they don’t know the answer to something – just a reminder to all of us: it’s okay not to be perfect). So, USDA? If you read my blog, I’m going to suggest that instead of ammonia-rinsed beef that you purchase more beans. How about 7 million pounds of beans? Beans are already a USDA-recognized protein and we already know that we need to be eating more plant-based protein. Hey, I love meat and eat beef about once a week (chicken, turkey, bacon, and sausage round out the week). But we all should be trying to eat less meat for our health and for the health of the planet. My mom makes amazing black bean vegan “quesadillas” and, although I haven’t quite been able to replicate her recipe in the kitchen, they would be perfect for school kids. Just add some cilantro grown in a school garden or some chopped tomatoes in the school’s salad bar (salad bar update coming soon!) and “pink slime” would be but a memory. Thanks so much for sharing the petition with your readers. Just FYI, I’m going to have an op-ed in the Houston Chronicle this week which will discuss, among other things, that precise issue — whether we ought to like pink slime because it’s “sustainable” and less wasteful than not eating these scraps. The Beef Industry’s press release that you quoted is typical bogus industry speak… “watchful eye of USDA inspectors” is a joke. The USDA’s job is to promote the consumption of beef (and other commodity foods like dairy and corn)… There job is not about keeping it safe to eat. That’s the FDA’s job. A far better solution indeed is to eat less beef, and certainly less beef that comes from Confined Feedlots, where this stuff most certainly is derived. Thanks to you and Bettina for helping raise awareness of this issue! Thanks for the post. I’ve signed, passed it along, and am making people sign as well!! You’re alternative is a great idea, such positive thinking! This is such an unbelievably great post. You really are changing the world. Here are a few facts about the so called “pink slime”. The same method is used in any mechanically separated food product. Whether it be tomatoes, chicken, turkey or beef. Hot dogs are the first one that pops into my mind. Hot dogs are safe to eat, and students do eat them. The fact remains that students will only eat what they are used to having… starting at home. If you community normally eats beans, then beans might be a viable option. If your community eats beef, and lots of fast food due to poverty beans are not a viable option. Food is not a one size fits all approach. If you don’t have a problem with eating industrially raised beef, then pink slime shouldn’t bother you all that much. Pink slime is basically just a distillation of everything that’s wrong with industrially raised beef, bumped up to the next level of mechanization and chemicalization. Cows aren’t meant to eat corn, get sick, consume large doses of antibiotics, and be jammed together in filthy e coli-ridden feedlots. You really want to go the next step and have machines scrape all that connective tissue off, blast it with ammonium hydroxide, and then be able to eat it? Be my guest. But be out in the open about how that meat is gotten; consumers have a right to know. LABELLING, please. I have less of a problem with e. coli than I do with ammonium hydroxide. I pretty much handle all meat with the assumption that it is tainted with e. coli, and I have a very hygienic system in my kitchen that prevents cross-contamination. You can kill the e. coli if you just cook the beef long enough, but the chemical tang of ammonium hydroxide? You’ll need a LOT of ketchup to disguise that flavor. I would, howrever, like to beg against mainlining cilantro in food, as one of those people with the ‘tastes like bleach’ gene. While probably 80% of kids will like the flavor boost, but there is a not insignificant segment who will be unable to stomach it, quite literally. My entire family can’t touch anything that’s used it, and I know many others the same! It’s not a question of adjusting, it just flat out tastes like bleach to us (Others compare it to soap, or other chemically tastes). Other than that I agree on everything here! Buying crappier food, but more of it, is not at all what our schools and children need. Truly, there is something to the saying ‘you get what you pay for’ and pink slime is the very epitome of that phrase!